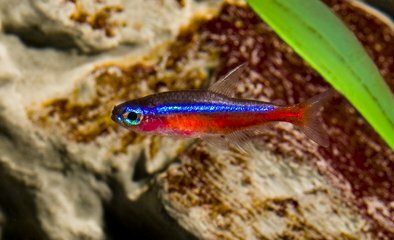 The Cardinal Tetra is my favourite of all the Tetra I have kept, although I am also very fond of Bleeding Heart Tetra. It is one of the most popular of freshwater aquarium fish available and its really easy to see why. They have such stunning colouration; a shoal of these will make any aquarium look amazing. Despite being one of my favourites, I put off buying these fish for a really long time; I always thought my hard alkaline water would kill them straight away. For a new fish keeper or someone unfamiliar with this species it is easy to get the Cardinal and the Neon Tetra mixed up. Both are lovely, but they require different care so it is a good idea to be able to tell them apart. The cardinal is slightly bigger than the Neon Tetra. The red line on Cardinal goes all the way to its tail, but on the Neon the red line only goes about half way. Like most Tetra they are peaceful good community fish . However due to their small size if they are kept with the wrong tank mates they tend to get eaten. A common combination is Cardinal and Angelfish, visualy this is great combination with blue / red of cardinals and white / orange / black of the Angelfish. They are also both slow moving fish which can give the aquarium a serene peaceful feel. While keeping these two together is fine while the Angelfish are small, but when they start to get bigger they will start eating their smaller tank mates. I would avoid keeping these fish with most large Cichlids. A good choice would be some of the many less aggressive dwarf cichlids . I keep mine with a selection of different tetra, two Keyhole Cichlids and a selection of other peaceful fish. The two Keyhole Cichlids never bother the tetra. I have I have also kept these fish with Rams and Kribensis and they have been fine. I as I mentioned above I put off keeping this fish for many years. The reason for my hesitation was their need for soft acidic water; I knew I would really struggle to recreate the water of their natural environment. Although it is possible to alter your waters pH and hardness it can be tricky and can do more harm than good. I eventually decided to give them a go and they have done brilliantly in my aquarium, it fact they look much brighter and healthy than they did in the shop. What makes this fish particularly difficult to cater for is that they come from different sources. Until fairly recently all the Cardinal Tetras available to buy in the shops were wild caught. They are difficult to breed and there are plentiful supplies in their natural environment, so catching the wild fish does not harm or endanger the species. In the wild the water can be as low as 4pH . Fish which have been imported from the wild will need be kept between 4 and 7pH . 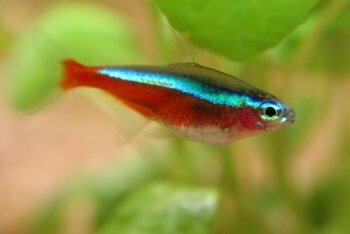 Recently you have been able to buy aquarium bred Cardinal Tetra, they can be more expensive than the wild caught ones but they have the distinct advantage of being more adaptable to a range water conditions in terms of pH and hardness. This makes than more hardy and accessible to a greater number of fish keepers. However, how do you know which type you are buying? It is worth asking before you buy, which type you are buying. They only grow to around 2 inches , but you will need to keep at 5 five together, therefore I would suggest a minimum tank size of 60 litres . If possible keep a much larger group in a large tank. In the wild their water would have a brown tint to it; you can achieve this by adding bogwood which has not being soaked first. New bogwood tends to give the aquarium a brown tint, it is normally suggested that you soak in a bucket for 48 hours before adding to tank. But if you want your aquarium to mimic their natural environment just add the bogwood straight way. Due to the low pH of their natural environment there would no or little plant growth, however keeping these fish in a heavily planted tank will do them no harm and their colours will look more striking against the back drop of a well planted aquarium.